Click here for Worth a visit info. The south coast has mainly a flat landscape with deep gorges, though, in places, has towering limestone cliffs. This part of the island has the majority of resorts scattered along the full length of the coastline. Ranging from quiet sleepy hamlets to quite lively (by Menorcan standards) family resorts. 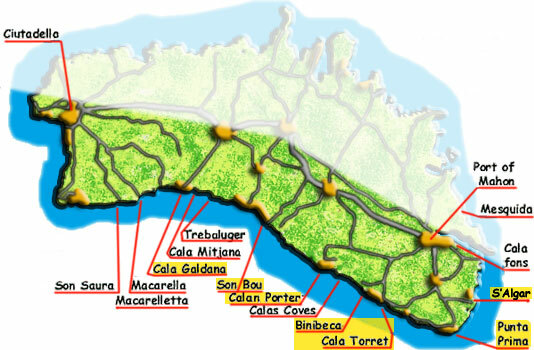 The majority of resorts can be reached from the main Mao [Mahon] - Ciutadella road. The south east resorts can be reached from Mao via Sant Llouis. Quite a few of the resorts now have modern beach bars where one can get a cool drink and even a good lunch. All have toilets for the customers use, but are open to all. Remember though to take a few cents with you to place in the plate near the door. 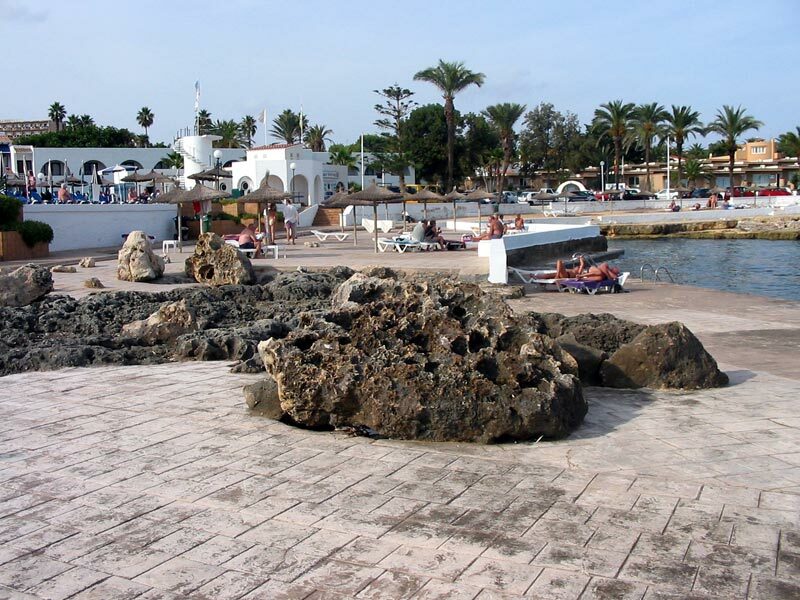 S'Algar is a small resort, situated on the south east coast of Menorca, just a few km from Mahon and Sant Lluis. S'Algar is an extremely well looked after purpose built resort. The good choice of accommodation includes two large hotels, a number of "apartment complexs" and privately owned villas. The centre has a fair choice of bars & restaurants along with a few shops that will cater for most people. This resort has more than most when it comes to sport facilities, and if if you're not content to lounge around you will find plenty to keep you occupied. The resort has no beach of its own the nearest being Cala Alcaufar, a 15 min's walk. Click here for the full resort guide. 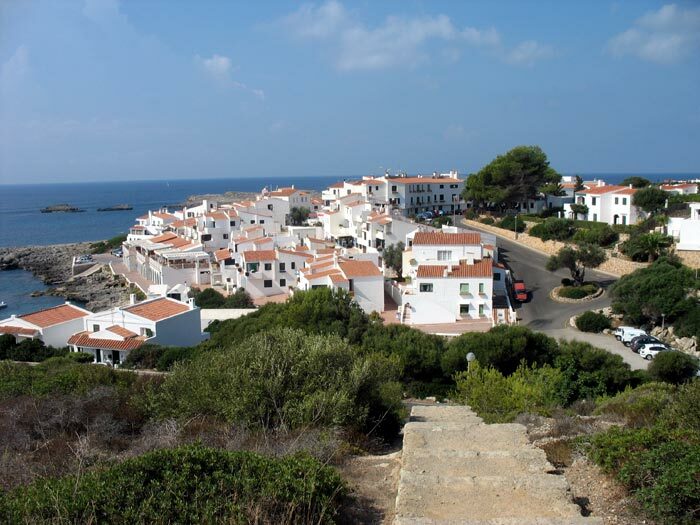 Punta Prima has several hotels, hostels and apartments plus a selection of good villas to rent. With a fine selection of bar / restaurants two supermarkets shops and car hire etc. Punta Prima has a very good and extremely attractive beach. But it can be dangerous with strong currents at certain times. I urge all parents with small children to keep an eye on them when out swimming, also take a note of the warning flag above the red cross building on the beach this tells you when it is safe. Binibequer / Cala Torret Lovely quiet resort consisting of Cala Torret to the east and Binibeca Vell marking the western end. All lo-rise apartments and villas with no high rise hotels. The area has a good selection of bars shops and restaurants, the best of which in my opinion are Pedros now run by the staff from D.P's and El Faros in Cala Torret. The Contrabanditos [Smugglers] mid way between Cala Torret and Binibequer Vell both very much worth a visit. 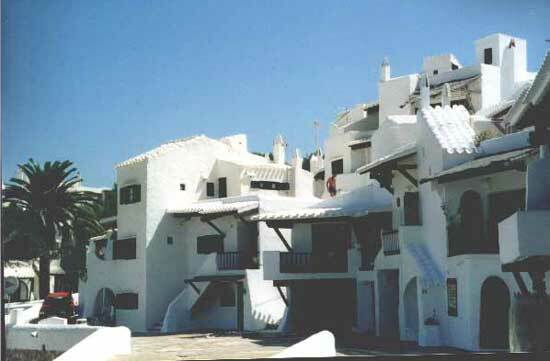 I have learned that there are to be big changes in Binibequer vell, I will give more info when the plans are confirmed. Son Bou has the largest (and some would say) finest beach on the island, it is entered down the road from Alaior through a short tunnel. There are two sol hotels at the eastern end, the beach outside these hotels can get rather busy, so my advice is take a five minute walk east. This beach can be dangerous with strong currents at certain times. I urge all parents with small children to keep an eye on them when out swimming, also take a note of the warning flag above the red cross building on the beach this tells you when it is safe. With nearly two kilometres of sand with plenty of beach bars it's easy to find a spot all to yourselves. Be warned though the further west you go, the less clothes people have on. Behind the beach is the San Jamie complex with plenty of shops bars and restaurants. Behind these the hillside running nearly the full length of the beach is full of magnificent looking villas. 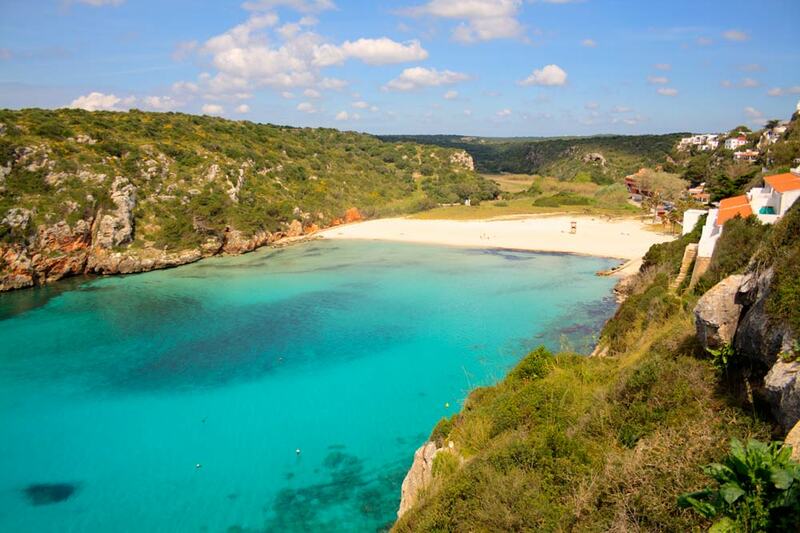 Cala'n Porter is one of Menorca's oldest resort and is perched high on the cliffs overlooking the good and safe beach. The resort is built on the eastern side of a very deep george that opens out onto a fine beach, with a small stream running down the edge most of the year. Everything you will need for a lively [by Menorcan standards] holiday can be found in Cala'n Porter. A full range of shops, bars and restaurants can be found in the compact center of the resort. Not to be missed is the "cova d'en Xoroi" the caves set high in the cliffs, it is now a night club. more can be found here. Cala Galdana named the "Queen of the Calas" and situated on the south coast. 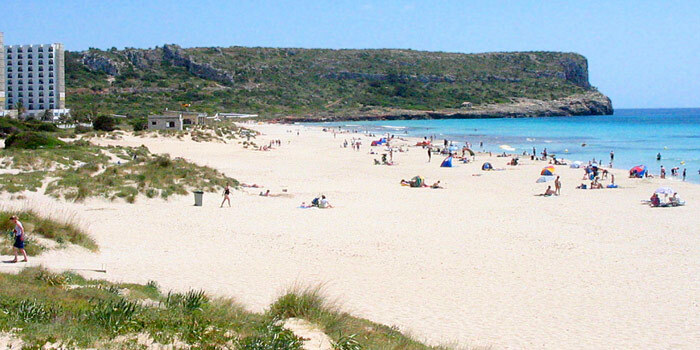 Just 11 km from Ferreries, is * the * most beautiful pine fringed bays in Menorca. It has probably had more picture taken than almost anywhere on Menorca. With emerald green waters and gently shelving sand it makes a perfect holiday destination. The village has a good selection of villas, hotels and apartments. With plenty of bars and restaurants that cater for every pocket. The small river, the Algendar, flows Into the sea here and enhances the natural beauty of the resort. However, the best view of the bay is from the top of the rocky cliffs at the eastern end of the beach. It can easily be reached by steps that climb there way up the cliff face from the beach. More than enough of the usual facilities are available, both on the beach and within the resort, added to this the calm water, safe bathing, boating and a good selection of water sports including diving. It is easily one of the most idyllic areas to take your hard earned holiday, Cala Galdana is a must for your list of day trips one not to be missed. More info can be found here. 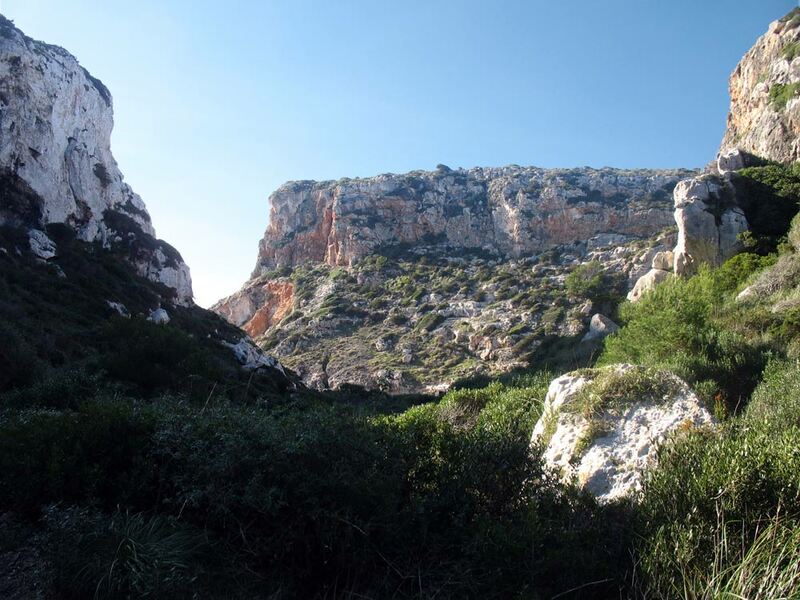 For those who like to amble around the countryside, the surrounding hills and cliffs offer ample walks and opportunities to explore the Menorcan countryside. "Barranc d' Algendar" (Algendar gorge) has a stream running through It entering the sea in Cala Gal dana, and is fairly easy to reach either from the road just out Ferreries or in Cala Galdana It is 6 kilometers long and the cliff walls reach 50 meters high in places. Or try a walk to Cala Mitjana to the east of Galdana, an idyllic south facing cove, bounded by wooded cliffs.